The price of Bitcoin SV rapidly dropped by 9% after the currency was delisted from Binance, one of the world’s largest exchanges for cryptocurrency. Prior to the delisting, Binance was the third-largest market for Bitcoin SV in the BCHSV/USDT trading pair. It now remains to be seen how the market will continue to react to the news of the delisting – will Bitcoin SV bounce back, flatten out or continue to fall within the month to come? What we do know is that both ShapeShift and Kraken, two other prominent crypto exchanges, have decided to follow in the footsteps of Binance and delist Bitcoin SV. At Kraken, Bitcoin SV deposits will be disabled on April 22, and trading will cease on all trading pairs involving Bitcoin SV on April 29. Withdrawals will still be possible until May 31, to given Kraken traders a chance to move their Bitcoin SV. In their public announcement, Kraken cites both community sentiment and ongoing litigation filed against the exchange by the coin’s advocates as reasons for their decision to delist the currency. For quite some time now, Bitcoin SV founder Craig Wright has been making waves in the cryptocurrency community by claiming that he is the person behind the pseudonym Satoshi Nakamoto – the mysterious creator of Bitcoin and the Bitcoin blockchain – and that the Bitcoin offshoot Bitcoin SV is a representation of Satoshi Nakamoto’s “true vision”. Despite being asked repeatedly to provide evidence for this identity claim by using a digital signature, Wright has refused to do so. Instead, he has chosen to sue those who publicly question his assertion. One of the members of the crypto community that has been very outspoken against Wright is Anthon Pompliano, of the crypto fund Morgan Creek, who has called for every exchange to delist Bitcoin SV. In addition to the legal attacks on those who question him, Craig Wright has also offered a $5,000 bounty to anyone who “doxes” (reveals the identity of) the person behind the Twitter account @hodlonaut. As a response, Lightning Labs co-founder Elizabeth Stark launched a bitcoin crowdfunding campaign to help @hodlonaut to pay for legal expenses. Also, Twitter users have been rallying behind the hashtag #WeAreAllHodlonaut to show their support. The delisting of Bitcoin SV from Binance comes after a period of increased tension between Craig Wright and Binance, founder and CEO Changpeng Zhao. 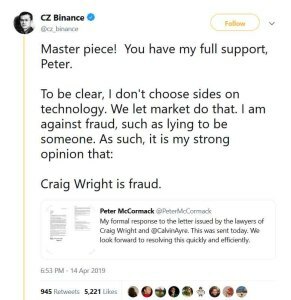 This is where Zhao has been accusing Wright of poisoning the Bitcoin community with his unsubstantiated identity claims and his threats to sue people who speak out against him.